Homemade cleaners are nontoxic and eco-friendly, helping reduce pollution to waterways and the air supply. They are less costly than store-bought cleaners. Many of the main ingredients, such as baking soda and white vinegar, are inexpensive—and are most likely in your pantry or laundry room already. Nontoxic homemade cleaners are safer for the entire family, including pets and people with allergies or sensitivities to chemicals. “More and more clients are recognizing the benefits of using less toxic, more natural cleaning solutions in their homes," says Anita Johnson, owner of Sunshine Housekeeping Services in Allentown, PA. "For some, the choice is in consideration of family members with allergies; for others, it’s a concern for the well-being of family pets." So which substances should you mix and match to clean? That depends on what you're tackling. Here's a full rundown on how to make homemade carpet cleaner, floor cleaner, and more. Sprinkle baking soda over the entire carpet surface. Let it sit for a few minutes, then vacuum the entire area. For carpet stains, use equal parts coconut oil and baking soda, and mix the solution well. Scrub the stained area with the paste and a toothbrush, blot with a moistened paper towel or microfiber cloth, and allow the area to dry thoroughly. For wood floors, mix ½ cup white vinegar, 1 teaspoon vegetable oil, and 1 cup water. Mix well, and apply to wood floors with a mop. Or for an all-purpose floor cleaner, mix equal parts water and white vinegar, and use a damp mop to apply. Finish by using plain water on a damp mop. Use ½ cup coconut oil, 4 tablespoons distilled water, and 2 teaspoons lemon juice. Mix well, and apply generously to wooden furniture surfaces. Wipe solution off with a clean cloth, and buff to bring out the furniture’s natural shine. Combine equal parts water and white vinegar, mixing the solution well. Apply the solution with newspaper or a streak-proof towel for best results. Mix ½ cup baking soda with a few tablespoons of water to form a paste. Coat your oven with the baking soda paste. Let the paste sit for at least 12 hours, preferably overnight. Wipe off with a damp cloth. For problem areas, spray a little white vinegar, as needed, and wipe the area clean. Use 1 cup white vinegar with 4 teaspoons Castile soap (a soap made from 100% plant oils, with no animal fats or chemicals). Mix the solution well, apply to the shower, and wipe clean. If your shower requires more abrasive cleaning, try two parts baking soda to one part water. Apply mixture to tough stains, let sit overnight, and rinse with clean water. Mix ½ cup baking soda with ¼ cup of salt. Pour this mixture down the drain. Follow by pouring 1 cup of white vinegar (heated to near boiling) down the drain. This combination of substances will foam and bubble. Allow the solutions to sit for 15 minutes, then run hot water down the drain for one or two minutes. Mix equal parts white vinegar and water, and apply the solution to grout with a spray bottle. Allow the solution to stand for a few minutes, and then wipe the entire area down with a clean cloth. For stubborn grout stains, mix a paste composed of two parts baking soda to one part water. Apply this mixture to stains and let sit, preferably overnight. Scrub with a toothbrush and rinse with clean water. Repeat as needed. Mix 1 gallon of hot water and ½ cup liquid Castile soap. Add 10 drops of any essential oil, and you have a great all-purpose cleaner for any of your spring-cleaning needs. When adding essential oils to housecleaning solutions, start with just a few drops, adding additional drops as desired. Always mix solutions well before applying to any surface. It’s best to mix window- or shower-cleaning solutions in a spray bottle. 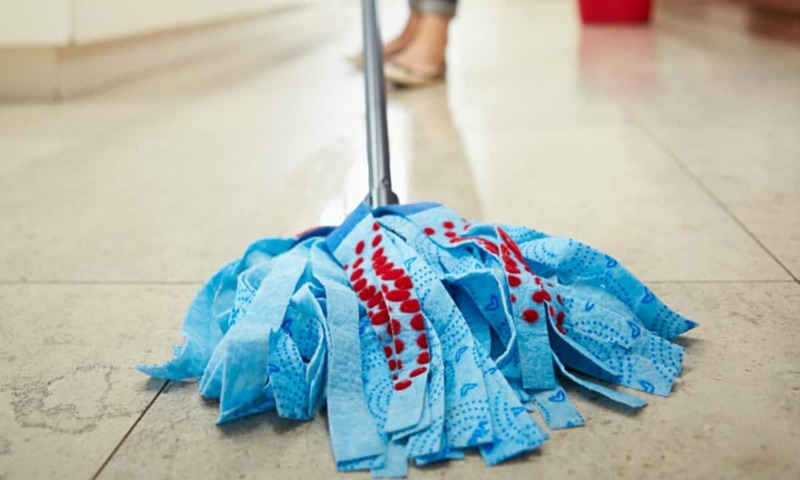 To enhance your natural spring-cleaning efforts, experts suggest using “greener” equipment, such as vacuums that are recognized by the American Lung Association, and microfiber cloths that don't shed lint, for the best health results.